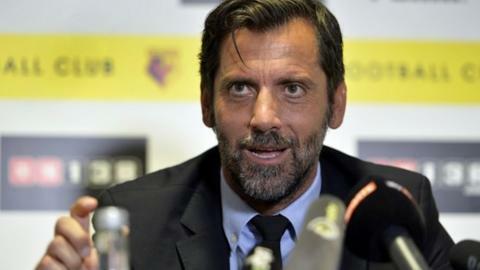 Watford will benefit from the club's multilingual dressing room, according to new boss Quique Sanchez Flores. The Premier League newcomers have made 10 summer signings from seven countries and their squad contains 22 different nationalities. "I think it is an advantage for us because when you are training more English players maybe it is difficult to change," said the Spaniard before their Premier League opener at Everton. "Now I can change habits very easily." Flores, the former Atletico Madrid manager, replaced Slavisa Jokanovic in June to become the Hornets' fifth manager inside a year. He has spent in excess of £20m bringing in players from France, Greece, Holland, Austria, Lithuania, Switzerland and Spain, but English will be the main language among the squad. "I've never had it before, so many different nationalities, it's the first time but a good experience." he said. "We live in England and all of the players understand English. "The most important thing is the atmosphere we can create in the dressing room in terms of they have a good relationship with each other. "Last year is finished, last year was enough for promotion, but everybody knows that it is not enough to play in the Premier League so we need to get a new step, a new level."